Meeting our guests, finding our ingredients, and encountering traditional culture; we at Gion Kawakami believe that all of these encounters should be treasured, for we may never experience them again. We hope to engrave each and every one of these encounters as irreplaceable bonds in the history of Gion Kawakami. To carry on with our guests in the spirit of our motto "kind hospitality, good taste, and fresh food"... is our only wish. Gion Kawakami does not have a set menu that changes from month to month. We use fresh ingredients gathered daily to prepare unique menus, based on our customer's requests. Gion Kawakami does not compromise any one of these when guests come to enjoy our service. Our business is to continue on the quest to hear that one word from our beloved guests, "delicious". 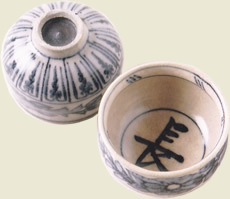 Color, form, and aesthetic sense all play important roles in the taste of Japanese cuisine. With seasonal ingredients, dishes, and arrangement of the room, we express the four seasons as they can only be experienced in Japan. 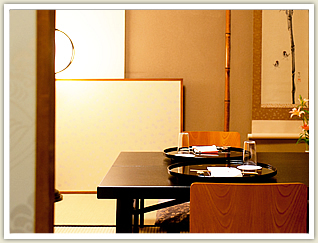 With sight and taste... with all five senses, we implore you to enjoy the seasons at Gion Kawakami. with the full blessing of nature. of Gion Kawakami's founding in 1960. In addition to our motto "kind hospitality, good taste, and fresh food", we also cherish the value of "teamwork". Not a single one of our dishes would be possible with the effort of only one person. It is only through the combined efforts and ingenuity of master chefs and craftsmen that the finest meals can be made. So come and enjoy the luxury of Japanese fine dining, in an establishment that prides itself on the dedication and vigor of its chefs. We hope that you can feel the four seasons in their finest natural ingredients, by enjoying cuisine crafted slowly and with ingenuity, unique to Gion Kawakami.